National American Miss Queens Getting Involved And Making A Difference! 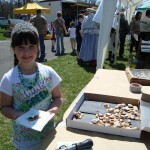 Gabrielle recently participated in an Earth Day event. 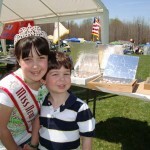 Gabrielle made Solar Ovens out of Pizza boxes and baked smores in them. Her friends were on hand to help hand out samples to the crowd. She then taught her second grade class about solar ovens and their use in other third world countries. It was a fun day and who doesn’t like smores? Gabrielle is having a blast representing National American Miss and her title. 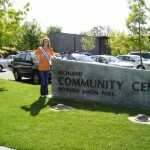 Soon, she will also be participating in the walk with Ronald to benefit her favorite charity, the Ronald McDonald house. Author Matt LevertonPosted on June 20, 2009 June 20, 2009 Categories General InformationTags american, leverton, matt, matt leverton, miss, namiss, national, national american miss, pageant, pageants, ronald mcdonald, solar ovenLeave a comment on National American Miss Queens Getting Involved And Making A Difference! Queens Working To Cure Cancer! 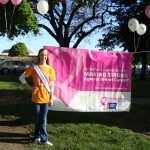 This past week Nicole Renard volunteered for Making Strides in Kennewick. It was a walk to raise money for breast cancer through the American Cancer Society. Here are a few photos. 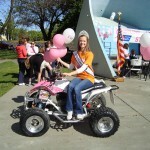 Author Matt LevertonPosted on May 12, 2009 Categories General InformationTags american, american cancer society, matt leverton, miss, nam, namiss, national, national american miss, pageant, pageantsLeave a comment on Queens Working To Cure Cancer! Happy New Year from all of us here at National American Miss. This year is going to be our best yet! Check out these articles I found about our program. Wow, it’s really here, by this time next week, nationals will be in full swing! I can hardly believe that I leave this Friday for California. I am so excited that I will get to see so many of these amazing families that I meet at the state pageants and meet so many from all over the country. Stay posted to the blog once nationals starts. I will be writing a lot to keep everyone informed on what is going on! Author Matt LevertonPosted on November 19, 2008 January 2, 2009 Categories Forum/Message Board, National PageantTags matt leverton, national american miss, National Pageant, pageant1 Comment on Nationals is almost here! Pageant Director Tells All! Why I Love My Job. When I meet new people, they often ask, “What do you do?” With a grin, I reply “I’m a pageant director!” That always prompts them ask follow up questions and gives me the opportunity to tell them about our organization. One of my favorite parts of being a director are the letters that I get after the pageant from parents and contestants. I literally have a file drawer full of them! I get the sweetest letters telling me how the pageant experience has impacted their lives. They talk to me about the confidence they have gained, the friends they made, how they were shy before and now have come out of their shell. I am often told that now they aren’t scared to try new things like running for student government, trying out for a team, that through the pageant they have gained that self-esteem to be able to step out and be a leader among their peers. The letters are truly inspirational. One letter I got about a year ago was from the sweetest little girl. As a project for school they had to write a thank you letter to someone other than a family member, and she picked me! OK, first of all, how cool is it a an educator is teaching kids not only math, science and reading, but also to be thankful and grateful, that is so cool in my opinion. But most of how, how touched do you think I was that this little girl chose me to single out and say thank you to! I don’t care how bad of a day you are having, something like that puts a smile on your face. In this letter, she simply stated that she was so thankful for all the pageant had done for her, the confidence, the self-esteem, the friends, it truly was a beautiful letter. My joy of this job comes from knowing that I am making a difference! I think as human beings we are all searching for purpose, and I have found mine. Through this program I have the opportunity to meet the most amazing kids and their families and play a role in their future. To all of you, thank you for giving me a chance to be part of you lives, I have truly been blessed. 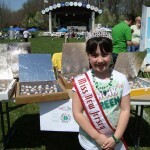 Author Matt LevertonPosted on October 20, 2008 March 14, 2011 Categories Background, Pageant Stories, WelcomeTags matt leverton, namiss, national american miss, pageant, pageant director4 Comments on Pageant Director Tells All! Why I Love My Job. Hey everyone. My goal increating this blog is not only create a forum for people to talk about all things NAM, but also a chance for you to interact with me in an informal environment. If you have any questions, please post them! If you want to tell me about your NAM experience, please post it! If you have any suggestions for me, please post them! Do you see a theme starting here…. 🙂 I look forward to hearing from you. Author Matt LevertonPosted on October 18, 2008 January 2, 2009 Categories Forum/Message Board, Your InputTags matt leverton, namiss, national american miss, pageant13 Comments on Your Input Is Welcomed! So one of the questions I get the most is, “how did you get involved in pageants?” Well here’s the answer. I grew up in Hagerstown, Indiana. When I was 13 years old I started working for a DJ company call Heart Breaker Video Disc Jockeys. When I first started I was just a DJ helper at school dances, wedding receptions, stuff like that. As I got older I started working as an actual DJ for the company and worked for them all through high school and college. Well, in 1997 the DJ company gets a call from Steve Mayes, the Indiana pageant director at the time. He was at the Indiana pageant and wanted someone to come and do some lighting at the pageant. He literally found us in the yellow pages! By this time I was one of the most experienced DJ’s in the company, so the owner, his son (Jason Black) and I went to the Indiana pageant to put up some fun lights. We had no idea what to expect. But as soon as I met Steve and Kathleen I immediately knew that this was a lot different than what I expected. I was figuring it would be like what I hear about on TV about youth pageants, boy was I wrong. I saw a staff that genuinely cared for the contestants, that had a goal far beyond giving out crowns, banners and trophies, they had a true purpose to see kids lives enriched for the better. I immediately knew that this was a program that I wanted to be a part of. After the Indiana pageant, I sat down with Steve and talked to him about working at some other events for him as a sound and light tech. That summer, I traveled to the Missouri and Washington pageants. The following year, I traveled to all the Mayes’ pageants doing the sound and lights. It worked out great since I was in college, it was the perfect summer job, traveling the country, working with an amazing group of people and mostly importantly, impact lives. After about 5 years traveling with the pageants I started to express interest that I wanted to get more involved and in 2003, while I was working as an algebra teacher, Steve contacted me and asked me if I would like to be a state director. To say the least, I was more than honored that he would consider me. I said yes and that year I directed my first pageant, Tennessee. Then in 2005 they offered me Kentucky and South Carolina and then in 2008 I was offered Oregon and the rest is history.